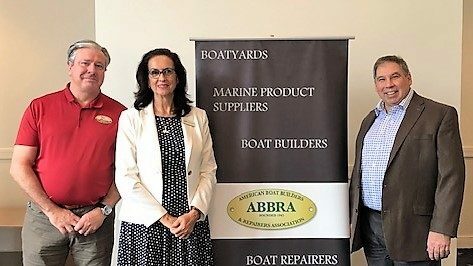 The American Boatbuilders and Repairers Association (ABBRA) held its 2019 Annual Meeting & Symposium on January 22 in Fort Lauderdale, Florida. The event theme was “Innovate, Integrate, Motivate…the Art and Science of Business,” and featured a line up speakers who shared their experiences and expertise. During the symposium awards were presented to outstanding businesses and industry leaders. The recipient of the Boatyard of the Year award was Camachee Yacht Yard. Boatbuilder of the Year went to Huckins Yacht Corporation. The Dennis Snow President’s award was presented to John Gambino, divisional vice president for the Great American Insurance Group. Three men achieved the designation of Certified Marine Service Managers and were presented their certificates: Chris Gagne with Kingman Yacht Center, Mike Mullaney with Frank Hall Boat Yard and Brendan Prior with Bristol Marine. ABBRA also elected officers and new members to its board of directors. 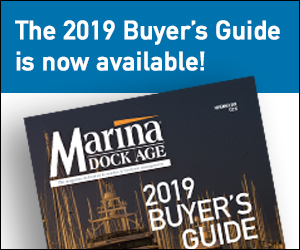 This year’s president is Chad Morse, Ahsbreez Boatworks in Anchorage, Alaska; vice president is Ernie D’Alto, Thunderbird Marine, Savannah, Georgia; secretary is Tricia Bennett, Bennett Brothers Yachts, Wilmington, North Carolina; Treasurer is Peter Sabo, Camachee Yacht Yard, St. Augustine, Florida; and immediate past president is Ron Helbig, Noank Village Boatyard, Noank, Connecticut. Joining the board this year as members of the executive board and regional advisory board (respectively) are Tim Shields with Hinckley Yachts in Portsmouth, Rhode Island and Brian Baker with Reynolds Lake Oconoee, Greensboro, Georgia.